How Did U.S. Get $14 Trillion in Debt and Who Is Owed the Money? Jim, thanks for putting the graph of who is creating or created the debt. 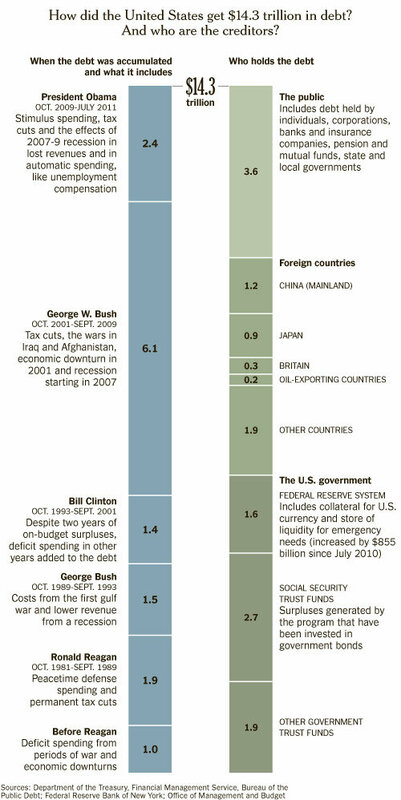 Clearly, George W. Bush did more to mess things up than all the presidents combined. Obama isn’t the greatest president with some of his programs but let’s face it, he had to try to clean up a mess that will take years if the U.S. can clean it up. The Bush debacle ended in Jan. 2009. The Obama disaster started thereafter. No matter how bad GWB was, the Obama Administration has topped it. His deficits are clipping along at over $1 trillion per year with the excuses coming a mile a minute. It’s gone from “Yes We Can” to “Oh No I Didn’t”. Actually, I think this is a terrible graph. The right side is broken down using an analysis that is presumably entirely fact based and incontestable; a simple and reliable exercise in accounting. The right side appears to contain highly debatable and imprecise estimates. When one includes taxes that were not collected and the affect of a recession as concrete numbers, one steps well outside of the realm of accounting and into political conjecture. If the analysis presumes to be able to calculate the affect of economic growth rate on the debt, does that mean there is some “correct” level of growth? If it does, does the analysis take into account the marginal stimulus to the economy of spending and tax cuts? Do tax cuts from before the Reagan administration cumulatively affect the debt (remember 90% marginal rates)? In short, the right side is fact, the left is opinion.